Minimize, hide any application to system tray, itâ€™s like boss key. Hide them all! You can minimize application by shortcut key. You may choose applications which will be always minimized to tray. Minimize to tray easy to use. Minimize them all now! Actual Window Menu - Actual Windows Menu is a suite of the most essential tools for versatile windows control: minimize them to tray, set up priority, keep always-on-top, apply transparency, etc. 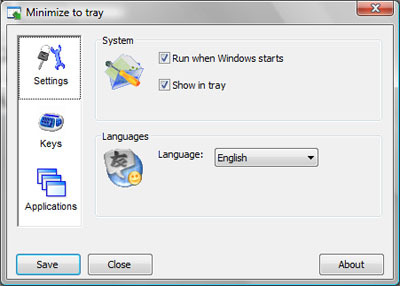 Once installed, the extra options are added to each window's system menu.